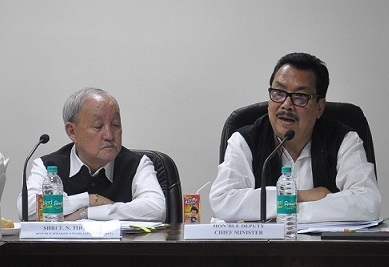 Arunachal Pradesh Deputy Chief Minister Chowna Mein had a meeting on the East-West Industrial Corridor (Phases I & II), a major road project, at the Civil Secretariat here on Tuesday. The road is proposed along the foothills within Arunachal Pradesh from Pasighat in East Siang district to Bhairabkund in West Kameng district (in Phase-I) and from Kanubari in Changlang district to Manmao via Tirap Gate in Tirap district (in Phase-II). Mein said that the proposed corridor is part of the announcement made by Union Minister of Road, Transport & Highways Nitin Gadkari during his visit in January last year for construction of roads in Arunachal Pradesh worth Rs 50,000 crore. However, Gadkari made it clear that the proposed project would be sanctioned only when land is provided free of cost without any encumbrance, Mein said and added that “this road will be constructed only when the people of the State agree to donate land without claiming compensation”. The DCM urged the local legislators and the Deputy Commissioners of the districts (present in the meeting) through which the road will traverse to create mass awareness in this matter and to convince the people to part with some of their land for the important road project. “We have to do away the mindset of compensation if we want development,” he said. He further said that the corridor will be declared as a State Highway and asked Nector Engineers & Project Consultants, Ahmadabad to submit the proposed road alignment and techno feasibility report for examination by a high power committee headed by Assembly Speaker TN Thongdok as Chairman and Chief Secretary Satya Gopal as a member among others. He said the committee will submit its findings and recommendations to the Government for final approval. Thongdok emphasised on early finalisation of the alignment and completion of survey and investigation. Gopal asked the Highway Department to adhere to a strict timeline. Chief Engineer (Highway) T Basar highlighting the important of the project said the proposed corridor has been conceived along the foothill areas as it is one of the richest regions in terms of potential for agriculture, horticulture, fisheries and other cash crops cultivation. This stretch has the potential for establishing manufacturing industries such as fruit processing, packaging and establishment of industrial units due to the proximity with neighbouring Assam, where huge market potential exist and will improve the market linkages. He also said the road, once it becomes a reality, will reduce travel time from some parts of eastern Arunachal and western Arunachal to Itanagar by 2-3 hours as it will pass through the State without touching Assam. Basar further said the State Government provided Rs 18-crore for survey and investigation for Package-I from Pasighat to Naharlagun during the last financial year besides Rs 22-crore during the current financial year for survey and investigation of Package-II from Naharlagun to Bhairabkund. The money includes 10 pc of State share for DPR preparation of Frontier Highway. The survey and investigation for Package-I have been completed while that for Package-II is in progress, Basar said. Representatives of the Ahmadabad-based firm presented the proposed alignment, details of land acquisition, forest clearance requirement and design which were discussed in details in the meeting. Parliamentary secretaries and MLAs Techi Kaso, Kaling Moyong, Tatung Jamoh, Kumsiw Sidisow, Kento Rina, B Waghe, Tamar Murtem, Kardo Nyigyor participated in the meeting and agreed to do away with compensation for road. Among others, IGP Sunil Garg, in-charge PCCF, Deputy Commissioners, Chief Engineer for Design and Planning (PWD) Atop Lego, DFOs and engineers of Highways were also present in the meeting.